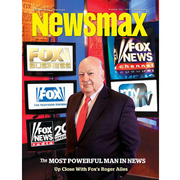 The November issue of Newsmax magazine takes an intimate look at the man who created and has run Fox News for 15 years. He's definitely NOT the kind of media mogul described by his liberal critics. In fact, you'll be surprised by what all of his staff — and even some of his political foes — REALLY think about TV journalism's leading trendsetter. In addition to hard-hitting investigative reports and special commentary from George Will, Michael Reagan, Ben Stein, Dr. Laura Schlessinger, David Limbaugh, Christopher Ruddy and others. 'Roger Ailes' Newsmax Magazine November 2011 The November issue of Newsmax magazine takes an intimate look at the man who created and has run Fox News for 15 years.